Hearing loss is a decreased ability to hear. 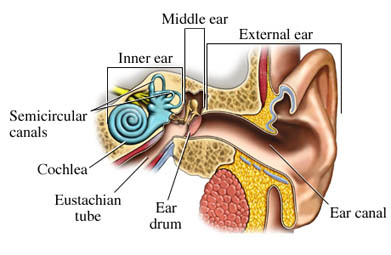 There are 2 types of hearing loss, conductive and sensorineural. There may also be a mixture of the two. Conductive hearing loss is caused by the interference or inability of sound to travel along the pathway from the outer to the middle or inner ear. This can include problems along the ear canal, ear drum, and the small internal bones. Hearing loss can be the result of genetics, aging, infection, blockage, disease, or injury such as loud noise or head trauma. In many cases, the cause of sensorineural hearing loss is unknown. Electrocochleography—This tests the function of the cochlea and the auditory nerve. The electrical response of your brain to sound may be tested. This can be done with brain stem auditory evoked response testing. If medications are suspected as a cause of hearing loss, your doctor will alter your prescriptions to see if hearing improves. Face the person that you are talking to. This will allow you to see their facial expressions and watch their lips move. Ask other people to speak loudly and more clearly. Turn off background noise, such as the TV or radio. In public places, choose a place to sit that is away from noise. Work with a special trainer to learn how to lip read. Lip reading involves paying close attention to how a person’s mouth and body are moving when they talk. It is common to feel isolated and removed in social situations. This can lead to feelings of depression or social anxiety . Part of managing hearing loss may include counseling or a support group. Stapedectomy—The stapes bone is removed or drilled, and replaced with a prosthetic. Tympanoplasty —Repair of a ruptured eardrum or the correction of a defect of the middle ear bones. Myringotomy —Incision of the eardrum to allow entrapped fluid to drain. Tubes may be placed in the ear to promote continuous drainage. If you smoke, talk with your doctor about the best ways to quit . Treat all medical conditions as directed by your doctor. Avoid exposure to excess noise. Use adequate ear protection when using noisy equipment. Cochlear implants. National Institute on Deafness and Other Communication Disorders (NIDCD) website. Available at: https://www.nidcd.nih.gov/health/cochlear-implants. Updated March 6, 2017. Accessed September 25, 2017. Hearing loss prevention. Better Hearing Institute website. Available at: http://www.betterhearing.org/hearingpedia/hearing-loss-prevention. Accessed September 25, 2017. Living with hearing loss. Hearing Loss Association of America website. Available at: http://www.hearingloss.org/content/living-hearing-loss. Accessed September 25, 2017. Sudden sensorineural hearing loss. EBSCO DynaMed Plus website. Available at: http://www.dynamed.com/topics/dmp~AN~T115342/Sudden-sensorineural-hearing-loss . Updated August 25, 2017. Accessed September 25, 2017.